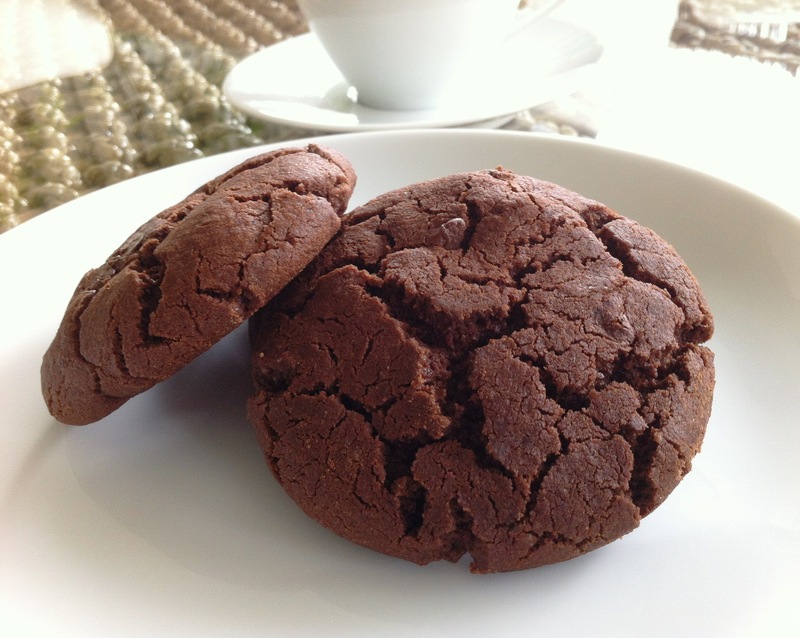 For my last installment of recipes from my name-day picnic, I will share with you these amazingly good chocolate biscuits (cookies). They are absolutely divinely chocolaty, and just one can really hit the spot. Two will put you in a chocolate nirvana! These keep really well in an airtight container, and apparently you can freeze them for up to a month. Talking of freezers, mine is playing up a bit. Yesterday evening while I was watching The Good Wife (important details for a blog post these) I heard the alarm going, which means the temperature had risen to -11 (from -18 where it should have been). This has happened once before but then I thought the door had been left open by accident. This time I checked and the door was safely shut tight. I wonder what’s going on. A while back it was also making some strange whirling noises and the service people told me I should defrost it (so much for no-frost technology!). After a couple of days, which I spent thinking about the logistics of this (namely, where do I put all the stuff from inside it while it defrosts) it stopped rattling. So I just forgot about it. As you do. To be honest I’m afraid this is all due to the huge amounts of food stocked in there. Yes, I love my freezer. Do you know the Tetris puzzle on computers? Well, you have to be good at that to get things in there at the moment, it’s so full. I just know that’s what they’re going to tell me is wrong with it. So I’ve come to a decision. I’m buying a deep freeze. I’ve been wanting one for ages but I’m worried about where to put it. I’ve no room in the flat, our storage room in the basement doesn’t have a plug, so the only other option is the balcony/veranda. There is a good corner it could go in, but I have some concerns about the temperatures out there in the summer. It can easily reach 38 in the shade, if not more in a heat-wave. I think I might be asking too much of an electric appliance that needs to maintain a temperature of -18!! Oh dear, I’ve just read this back to myself and can safely say it’s the most boring post I’ve ever written. I’ll stop right away and get back to the main issue. Chocolate. Lots of it. In cookies. My version is slightly adapted from a recipe in the British Good To Know Recipes magazine. Line two baking trays with grease-proof paper. Preheat oven to 180C. Mix the chocolate chunks and set aside without pinching too many. Using an electric mixer, beat the sugars with the butter in a large bowl until light and fluffy. Sift in the flour, cocoa, baking powder and baking soda. Take a tablespoon full of mixture and form a small ball in the palms of your hands (like a meatball). Place it on the baking tray. Flatten the chocoballs a little with your fingers (they’ll flatten a bit more while baking). Bake for about 10-12 minutes or until just firm. Don’t over bake! Enjoy with a glass of milk, or as I like them, dunked in hot milky tea.